No matter what you do in life, you will experience breaking points from time to time that will test your character. The question is, will you get through it or will you give up? 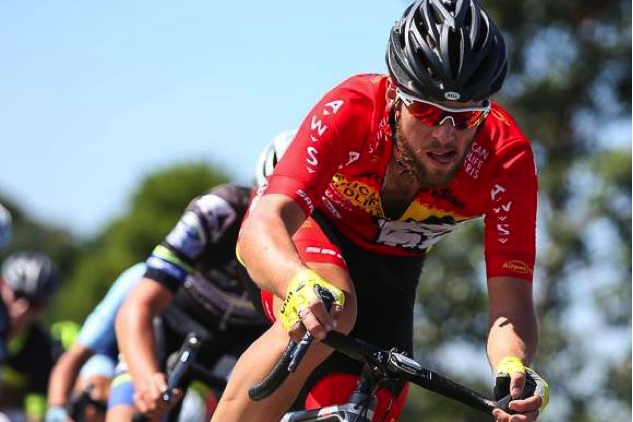 There’s no doubt that the world of amateur cycling is tough, particularly if you’re climbing the ranks via the National Road Series here in Australia. Most NRS riders will cover almost seven hundred kilometres per week over multiple five-hour training sessions. They travel around Australia representing a team and on race day they need to perform their best to be competitive. They’re tired when they’re off the bike and busting their gut when they’re on it. It’s highly demanding, both physically and mentally, yet the financial return is non-existent for most. With no financial benefit and a bucket load of sacrifice, why do it at all? Darcy Woolly is a 22-year-old young gun road cyclist from Mortlake, Victoria and a genuinely humble, all-round nice guy. He’s a country boy with integrity but with a real fire in the belly. Darcy has a clear desire and determination to get somewhere in cycling. It’s for that reason he’s now preparing to tackle the American Pro Continental Series with Canadian team Garneau-Quebecor – a team many consider a stepping stone into the professional ranks of cycling with it’s slightly mysterious structures and team dynamics. But getting there has been no easy feat, it has required immense sacrifice and lots of learning along the way. 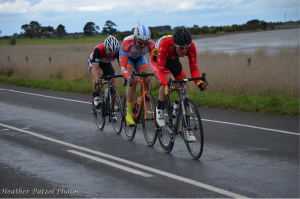 Darcy made his way through club and Victorian Road Series grades rather quickly. He was soon racing in A grade and entered the National Road Series (NRS) at the age of 19. The step into the NRS was big and Darcy was told by his coach (Andy Graham) that “it will take you three years to get used to the pace of NRS. You’re going to have to learn how to get dropped”. In Darcy’s first top-level race, he got dropped during almost every single road stage. He finished twenty to thirty minutes behind the main bunch until he finally made it around with the group on the final stage. “I wasn’t sure if everyone was just tired from the week, but I was happy to finally get around”, Darcy says. Darcy realised that he would need to change his approach if he wanted to succeed in the NRS and eventually beyond. Secondly, Darcy changed his role within the team. He had been used to driving breaks and winning sprint finishes, but now took on the role of the “workhorse” in the AWS team. He would soon have to learn how to meticulously follow team instructions, pick the right moves, and identify gaps that he had previously seen as non-existent. With his newfound identity as the workhorse, Darcy still managed to get a few top three placings under his belt – the most notable of these being a second stage win at the Tour of Murray. With three years of riding at the top level in Australian cycling, Darcy has now built the foundation required to take back the reins as a sprinter. But how can you all of sudden be one thing, and then transition into another? Training is the answer! To make the transition, Darcy has spent the last five months focusing more on sprint specific training. His new training regime includes one strength training session a week, focused specifically around stability and leg and core strength. “I’m no hero”, says Darcy. “I think I’m lifting fifty kilograms on the squats, but it’s a start”. One of his weekly sessions on the road is now focused specifically on sprinting. He does both standing and seated sprint efforts of fifteen seconds followed by five consecutive forty-second sprints with a twenty-second rest in-between. The set of forty-second sprints is repeated three times. As a result, Darcy has been able to increase his ability while spending less time on the bike. His restructured training sessions normally last about three hours. 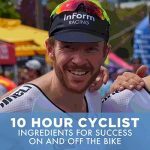 “I come home from these sessions far more depleted than the typical five-hour endurance ride”. 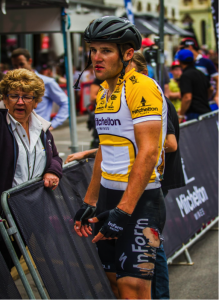 Not a happy chappy after being taken down on the last corner of the last race of the Bay Criterium Series. The full interview with Darcy is available via a podcast on iTunes; see the link at the top of this article. Thirty-one minutes into the interview Darcy speaks about a breaking point where he was seriously considering “racking the bike” to get “a real job”. During the winter of 2015, at a time when there was a significant gap in the racing season, Darcy was training long hours on country roads. This created a perfect storm that would make Darcy seriously consider his cycling career. But as you may have guessed, he didn’t rack the bike. In fact, he’s now sporting a new pink bike; riding through the beautiful terrain of Canada and experiencing an opportunity that could’ve gone begging if it wasn’t for his commitment to continuous improvement with the hope that one day, he’ll be knocking on the pro peloton door. Winning that next race or taking that next step towards your cycling goals won’t happen without hard work and sacrifice. When the alarm clock goes off early in the morning and you hear the pitter patter of rain echoing into your bedroom it’s time to get on your bike and get just on with it. You don’t know what possibilities lay ahead unless you put in the effort. Good story Darcy, keep trying and you may well get there. Well done Darcy, best wishes for your future, I have great respect! Champion bloke on the way to the top. Keep at it Darcy, your a great rider, your sacrifices and hard work will payoff, you have come a long way from when you were a teenager in Mortlake. well done! Watched you take a strong second in yesterday’s Preston Crit in Ottawa and think you should have taken it by several seconds as you were clearly strong and on form. To be honest, I’d never heard of you until yesterday though as I watched the 62-rider pack during the first half hour and you shot out the front and for a while held a strong gap I was wondering two things. Were you a super-strong rider who could clearly outclass the group and hold the gap or were you expending too much energy too early and would you pay the price toward the end? You may not have even heard me though I was the guy who started shouting ‘pace yourself’ as you sped by and who then kept yelling ‘hide’ once the chase group had caught you (or you’d deliberately fallen back – I don’t know which happened) as I sensed your legs were probably strong but that tactically you need to draft and conserve energy for the long haul and until the final lap sprint when you could shoot out. On reflection, I think your initial break was unnecessary and cost you the race. Had you stayed near the front of the pack and waited and drafted, like Andre Greipel would do, you would have had your weight in beer. Continued success!